The fear and disinformation from the leftists is very apparent. Susan Roesgen deserved to be taken to task as she was. 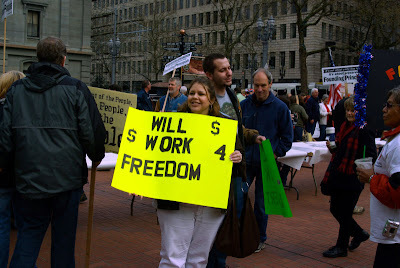 **Crowd Estimate at PDX Tea Party at Pioneer Courthouse Square: 4000-7000!! check out more pictures from Q Madp here and Kitanis’ here. People’s Republic of Portland REPRESENT! LISTEN TO THE FOUNDERS, FOOLS! The Portland Mercury demonstrates its wilful ignorance of the issues and rationale. They show they don’t do their homework—on purpose. Hey, maybe the dog ate it or something…And they used the pictures of the crowd before the rally started. He guys, I saw your boy Matt at the square–after 6 when the rally started. Why pictures from between 4:30 and 5:30??? Maybe “anti-tax” isn’t the best way to sum up the patchwork of passionate protesters at today’s Tax Day Teabagging Party in Pioneer Square. The protest issued a come-one-come-all invitation to people upset at the current state of the union, whether they’re mad about the bailout, mad that Obama is a raving socialist in cahoots with the Europeans or just mad about gays. Much of the resulting thousand-person crowd seemed to be straddling that fine far-fringe line between libertarians and anarchists. At one point a large group chanted “U!S!A! U!S!A!” while simultaneously waving signs demanding an end to federal government. Get ready, America. I have a feeling it’s going to get ugly.